does my dog need goldpaw? We know you’ve thought it at some point - does my dog really need to wear clothing? We understand that many people may scoff at the idea of putting a sweater on a dog. You might feel strange or silly subjecting your dog to this “humiliation”. You may worry that other dogs are judging yours. We want to assure you though; those other dogs are wishing they had a fetching, cozy, Goldpaw fleece to snuggle up in. Yes, dogs come equipped with their own external layering system, but some dogs have lighter layers of fur than others, and some are not genetically suited to the environments in which they live. Some people watch their dog shiver in misery due to the colder temperatures because they cannot warm themselves with the small amount of fur they have. 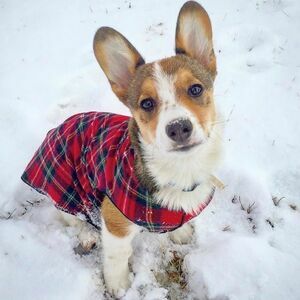 Your dog may feel just as uncomfortable going outside in the cold as you would if you had no clothes on. Depending on the breed, size, and age of your dog determines how warm they can keep themselves. Smaller breeds and breeds with short hair may benefit from a warm sweater while relaxing indoors as well as when they need to go outside. Older dogs with weakened immune systems and dogs with diseases that impair hair growth (i.e., Cushing’s disease, hypothyroidism, allergies, etc.) typically need an extra source of warmth and outer insulation can be easily provided by a sweater or coat. 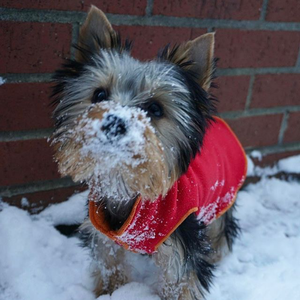 Having on a cozy layer can make a significant difference in your dog’s feeling of well-being. If you’re fortunate enough to live in a wet climate like those of us at Gold Paw Series, you know the importance of a good rain coat for your pup. No one loves the smell of wet dog or having their car seat soaking wet. Is your dog really that comfortable when they are cold and soaking wet? Having that waterproof barrier between the elements and your dog can make a dramatic difference in their attitude outdoors. We sure would be miserable if we had to play outside in the cold, pouring rain! That’s why Gold Paw Series is dedicated to improving the lives of dogs and their owners with thoughtful, practical solutions to everyday problems. We make the best cozy fleece and waterproof coats that can be worn comfortably indoors and out. Not to mention, your dogs will love the attention you show them while getting dressed, so don’t forget to have fun while staying toasty!